Walk Your Way to a Healthier Life. Start On National Walking Day! You can get active in lots of ways, but walking is one of the easiest steps you can take to improve your health. It's also one of the safest, least expensive and most sustainable forms of exercise. For some time now I have been a passionate supporter of the American Heart Association and of National Walking Day. I ran my first marathon 10 years ago to honor the memory of my recently deceased father. It was a defining moment for me when I crossed the finish line and received my medal. I knew -right then and there- I had the power to fight heart disease by raising awareness in the community and by choosing to live a more active lifestyle. Since then, I have completed three more half marathons and have become very disciplined about walking as a form of exercise. On most weekends I try to get outdoors to walk my dog and log anywhere between 10 and 20 miles, when the weather isn't great, I hop on my treadmill and try to get in my miles that way. Walking as form of exercise has helped me stay fit and focused on maintaining good heart health. 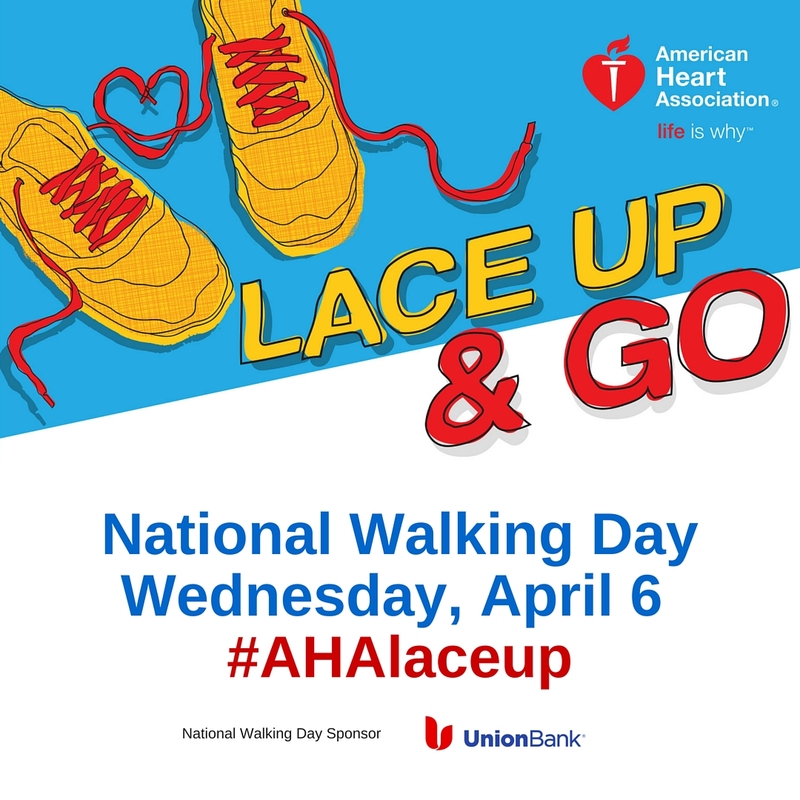 Lace up and get moving with the American Heart Association in celebration of National Walking Day, Wednesday, April 6 and the health benefits of an active lifestyle. Union Bank is a proud sponsor of the AHA's National Walking Day activities because we believe in the direct correlation between good physical health and good fiscal health. These days, we're spending more time at work and sitting in front of a screen than ever before. We're becoming less active, which can increase our risk of heart disease, stroke and other diseases. Reduce your risk of heart disease, stroke and type 2 diabetes. Improve your blood pressure, blood sugar and blood cholesterol levels. Prevent weight gain and lower the risk of obesity. Increase your energy and stamina. Reduce your risk of osteoporosis, breast cancer and colon cancer. For such a simple activity, walking has so many benefits! Being inactive is a risk factor for heart disease and stroke, which are the nation's leading cause of death and a leading cause of disability. The American Heart Association recommends that adults should get at least 150 minutes of physical activity a week, and kids should get 60 minutes of physical activity every day. But about half of us don't make exercise a regular habit, and almost a third of us report participating in no physical activity at all. Maybe you haven't been active for a while. No problem. Take it step by step and start with just a few minutes a day at first, and then gradually increase your time and distance each week. Statistics show that people tend to stick with walking more than other forms of exercise. Take the dog out for a walk. Take the kids to the park or playground. Park farther from the entrance to your workplace, school, grocery store, restaurants, etc. Take the stairs instead of the elevator, even if just for one or two floors. Window shop at the mall or downtown. Walk to a nearby restaurant for lunch instead of driving. Catch up with a friend by walking around the block while you chat on the phone. The American Heart Association provides a wealth of walking, physical activity and healthy living information online at heart.org/BeActive. So be sure to pack your walking shoes and take them to work with you on Wednesday, April 6. Union Bank is pleased to encourage our employees and the community at large to be part of National Walking Day. I challenge you to go the extra mile for your heart!